Chicago Blackhawks winger Marian Hossa will miss the entire upcoming NHL season because of severe side effects from medication to treat a progressive skin condition he's been dealing with for years. The team announced the medical update Wednesday, one that could have a significant impact on the veteran's career and the franchise's future. The 38-year-old Hossa has four years left on his contract and says "playing hockey is not possible" for him next season. "While I am disappointed that I will not be able to play, I have to consider the severity of my condition and how the treatments have impacted my life both on and off the ice," Hossa said in a statement released by the Blackhawks, adding he's been privately undergoing treatment for the last few years under the supervision of Chicago's medical staff. Dr. Michael Terry said the team supports Hossa's decision not to play and that the skin disorder is "becoming more and more difficult to treat and control with conventional medications while he plays hockey." "We feel in the most certain terms this is the appropriate approach for Marian in order to keep him functional and healthy in the short term and throughout his life," Terry said. General manager Stan Bowman calls Hossa's absence a significant loss. Hossa, a 19-year veteran, has only missed 46 games over the past six seasons. He had 26 goals and 19 assists last season and has been considered one of the best defensive forwards in the league throughout his career. "His teammates and coaches know he battled through some very tough physical difficulties but never complained or missed games despite the challenges he faced," Bowman said. Hossa has been part of three Stanley Cup-winning Blackhawks teams during his eight seasons in Chicago. He has a salary-cap hit of $5,275,000 for the next four seasons. The cap-strapped Blackhawks can put Hossa on long-term injured reserve to get some relief from a deal that was worth $63.3 million over 12 years. 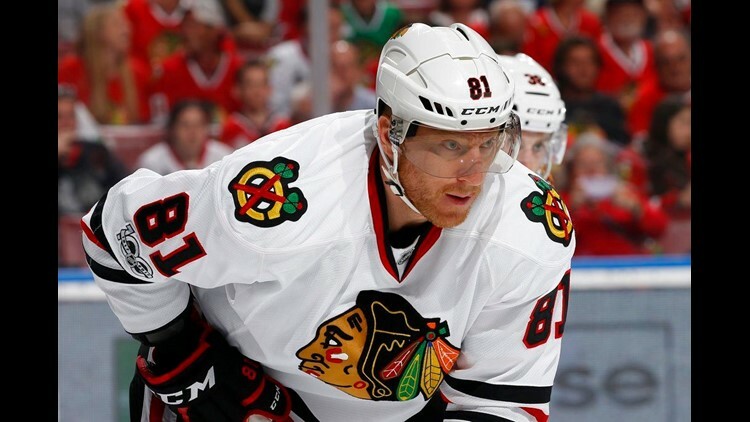 Hossa has already been paid $59.3 million as part of a front-loaded contract. In real dollars he's set to make just $1 million in each of the next four seasons, and because of that, the Blackhawks will likely keep Hossa on LTIR rather than him retiring and costing the team cap-recapture penalties that were instituted for the last collective bargaining agreement. With Hossa's cap hit off the books and defenseman Trevor van Riemsdyk and center Marcus Kruger linked to the expansion Vegas Golden Knights, Chicago won't have as many roster problems as originally predicted in the first season of Artemi Panarin's $12 million, two-year deal. But Hossa's on-ice contributions will be difficult to replace. Hossa has 525 goals and 609 assists for 1,134 points in 1,390 regular-season games with Ottawa, Atlanta, Detroit, Pittsburgh and Chicago. He has 149 points in 205 playoff games and has appeared in the Cup Final five times.